Here is my care package resume. In the last three years I have shipped a lot of cookies. Every week a box or two, filled with cookies baked with Monday Box love, embark on journeys short (Chicago, next day) and long (Afghanistan, 8 days plus). I have been blogging about my adventures in cookie travel for over two years. That’s a lot of cookie recipes. So my dilemma, when faced with choosing a recipe for this week’s Cookie Month ’14 theme, Best Shipping Cookies, was which to choose out of the many worthy candidates. The winner is Maple Biscotti. 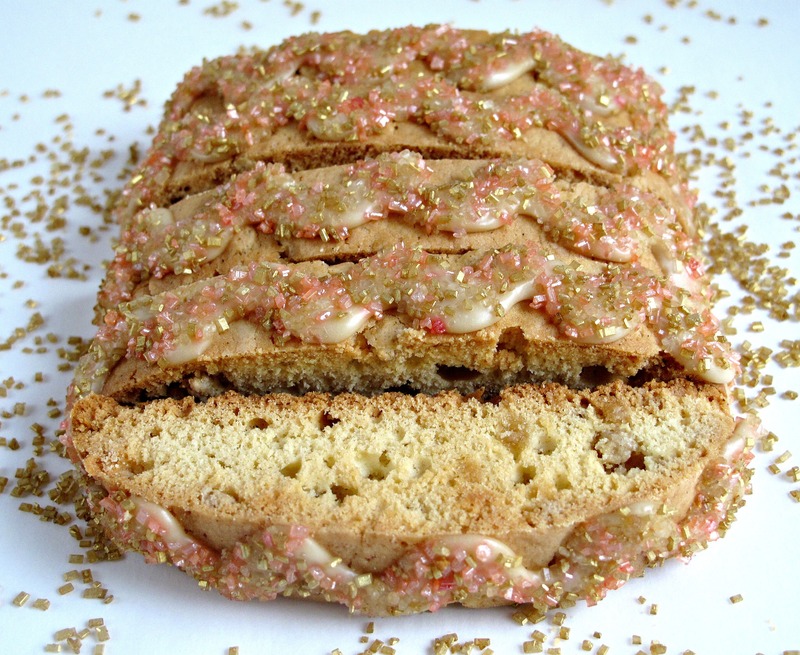 Maple Biscotti are a shoe in. Biscotti are the ultimate travel cookie. 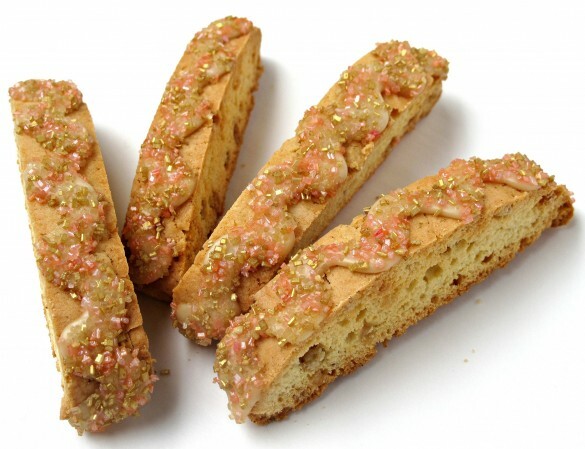 They are meant to be dunking cookies, with a dry, crisp texture which enables the biscotti to stay fresh for a long time. Biscotti made with dried fruit or jam (like Fig Jam Biscotti) often soften if stored more than two weeks, but most other biscotti (like Snickers Biscotti or Chocolate Espresso Biscotti) will stay fresh for up to a month. The difficult part was deciding what flavor biscotti to share for Cookie Month. The possibilities are limitless. If you like a flavor, chances are you can make biscotti that flavor. Maple is one of my favorite fall/winter flavors. Dipping a sweet, fragrant Maple Biscotti into a steaming cup of tea, coffee, or hot chocolate is wonderful on a blustery day. Traditional Italian biscotti are very hard, as in you could break your teeth hard. They are meant to be dunked, not nibbled on their own. I prefer a “dunking optional” sort of biscotti, sturdy enough to hold up to dunking, but tender enough to be munched on independently. I loaded the Maple Biscotti with flavor from a variety of maple ingredients; maple sugar/maple syrup, maple flavoring, and King Arthur maple Flav-r-bites. The dough can be made with either maple sugar or maple syrup. The recipe includes directions for both. Maple sugar is made from 100% maple syrup and pours just like granulated sugar. Using maple syrup requires a little more flour and a short chilling time to accommodate the extra liquid in the dough. 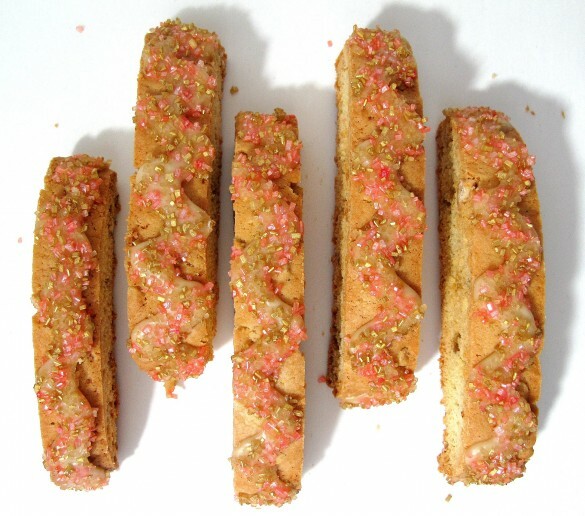 In addition to maple flavoring, maple Flav-r-bites further boost this biscotti’s flavor profile. The tiny, lentil sized pellets look a bit like rabbit food. Straight out of the bag they are hard and crunchy and only mildly sweet. 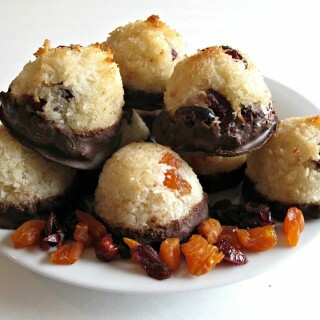 Baked into a batter, Flav-r-bites soften and infuse each bite of cookie with a burst of flavor. For Maple Biscotti, I just stirred the Flav-r-bites right into the dough. 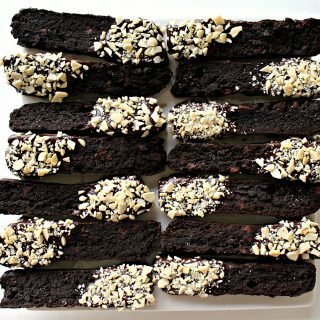 I think the Flav-r-bites add great flavor and a just right bit of extra crunch to these biscotti. 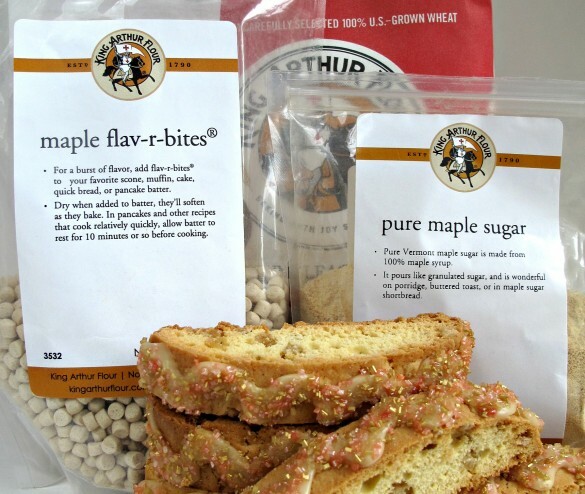 To enjoy Maple Biscotti without Flav-r-bites, I suggest increasing the amount of maple flavoring to ¾-1 teaspoon. In my experience, King Arthur baking ingredients are top quality. Their maple sugar and maple Flav-r-bits take these Maple Biscotti up a notch. With gift giving season around the corner, gazillion boxes of delectable home baked goodies will be winging their way across the country and around the world. I neglected to mention in my care package resume, that I have achieved Master Packer status. 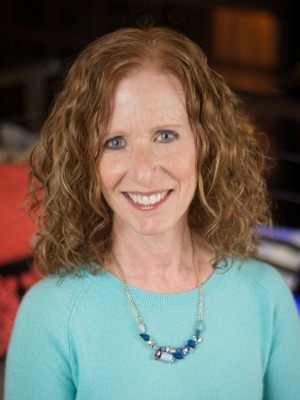 The goals of sending a care package include the joy you get from sending your love in a box and the joy of the care package recipient when they open their care package and indulge in the contents. Getting the contents to their destination intact and as fresh and tasty as possible requires just a bit of know how. These are my five top tips for care package mailing success. 1. Choose your recipe wisely. Not all cookies are created equal. The best shipping cookies are sturdy and stay fresh at least five days. NOTHING REQUIRING REFRIGERATION (NO CREAM CHEESE FROSTING) SHOULD BE SHIPPED. That may seem obvious to some people, but I have learned that it is not obvious to everyone. 2. When you pack there should be zero wiggle room. Cookies that wiggle while traveling do not arrive intact. Gently shake your box before taping it up. If you hear something moving around, fix it. 3. Use whatever method is available to you to wrap the baked goods as air tight as possible. A vacuum sealer virtually ensures freshness, but not everyone has one. Double wrapping in plastic wrap or bags may be the next best option. 4. 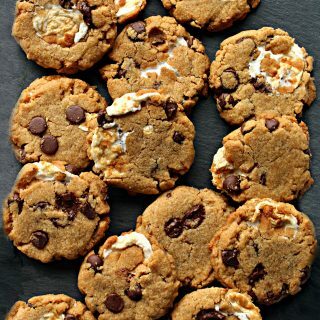 Never store soft and crunchy cookies in the same bag/container. The cookies will share the wealth of moisture and neither will have the right texture when they arrive. 5. Plastic wrap/bags do NOT keep out strong smells. If something mint flavored is in a package, let it fly solo or with other mint items, otherwise, everything will arrive minty whether you intended it or not. The same advice goes for including scented soaps or toiletries in the same box as baked goods. Axe, Brut, and Irish Spring are not meant to be cookie flavors. Biscotti should be on everyone’s care package and gift giving recipe list. These Maple Biscotti are sure to bring a smile to anyone lucky enough to give them a bite or a dunk. Two dozen biscotti means a dozen to share and dozen to munch. **NOTE** for using maple syrup in the dough to replace maple sugar: add ¼ cup maple syrup grade B, use an additional ½ cup flour, and chill the dough in the refrigerator for about 30 minutes before shaping into logs to reduce stickiness. In the bowl of an electric mixer, combine butter, sugar, (maple syrup if using), salt, vanilla extract, maple extract, and baking powder. Gradually add flour just until combined. Place half of the dough onto the prepared baking sheet and, using your hands and a spatula, form the dough into a smooth log approximately 10”x 2” and about ¾” thick. If the dough is too sticky to handle easily, refrigerate for 15 minutes. Repeat with the other half of the dough. Allow at least 4” between loaves for spreading. Allow dough logs to cool on the baking sheet for 10-20 minutes before slicing. Slice straight across the log, cutting about 12- ¾” thick biscotti from each log. Stand the biscotti on the baking sheet, close but not touching. Bake for an additional 15-20 at 325˚F, just until sliced sides of biscotti turn golden. Icing: Place confectioner’s sugar in a medium bowl and add maple syrup 1 tablespoon at a time until desired consistency. Using a spoon to drizzle or a piping bag, add icing on the top of each biscotti. 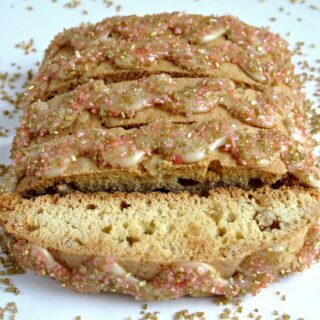 To add decorating sugar, immediately after icing each biscotti, hold over a bowl of decorating sugar, sprinkle the sugar to cover the wet icing. Gently tap excess sugar back into the bowl. Sprinkle each biscotti with decorating sugar before going on to the next. Allow to dry completely (about 1-2 hours depending on humidity) before moving. Store in an airtight container at room temperature for at least 2 weeks. Do not ice the biscotti if mailing to or from a hot location. Double wrap 2 or 3 biscotti in plastic wrap, cut sides together. Place bundles in an airtight container or zip lock bag. Okay, after reading this, I have this urge to buy some maple sugar and flavoring! : ) I’m glad you picked biscotti, which I am also a huge fan of. Have to admit I love the ‘break your teeth’ kind of biscotti but I am definitely in the minority and need to check out your recipe. 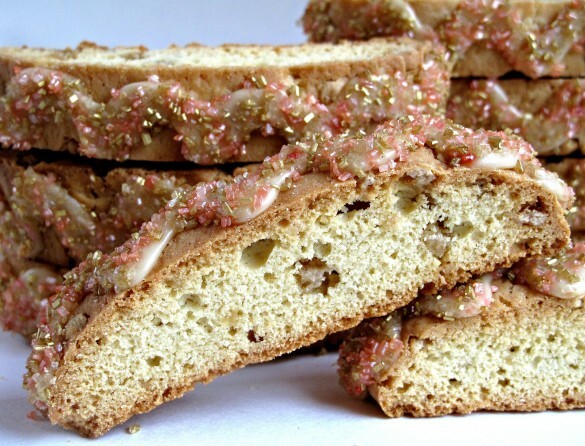 I’ve never had maple biscotti but it’s a wonderful idea! And biscotti really is a wonderful treat to send. Thinking about your care packages and all those cookies flying around makes me smile. I have never tried Flav-r-bites before and now you have me curious. Your biscotti looks amazing. I bet the maple flavoring is out of this world. Would love to have a few to dunk in my coffee this morning. Yum! Thanks! I had never tried Flav-r-bites before this, Shari. 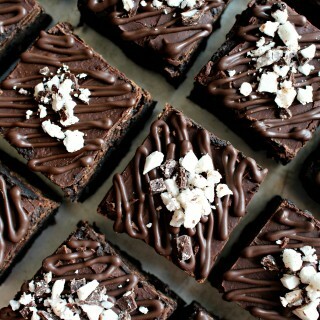 They are an interesting way to add a bit more flavor to baked goods. In the case of these biscotti, I threw in all of the maple flavor possibilities so that maple was front and center! 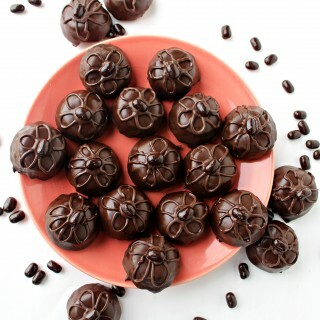 They are a delight with a cup of coffee (or WERE a delight, until we ate them all!). 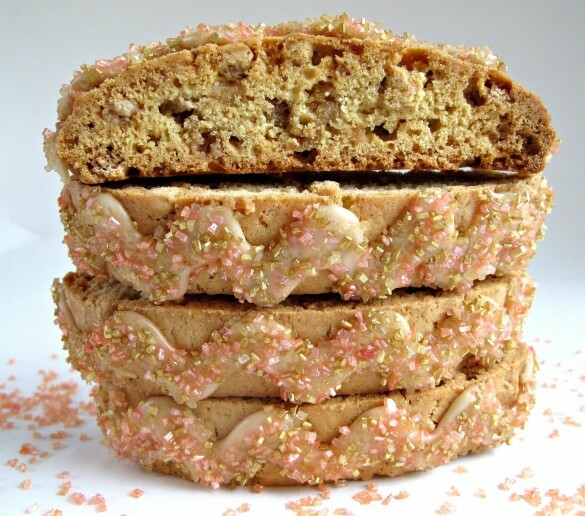 I think biscotti is so fun and this one looks amazing Wendy. I’m a big fan of anything caramel or maple. 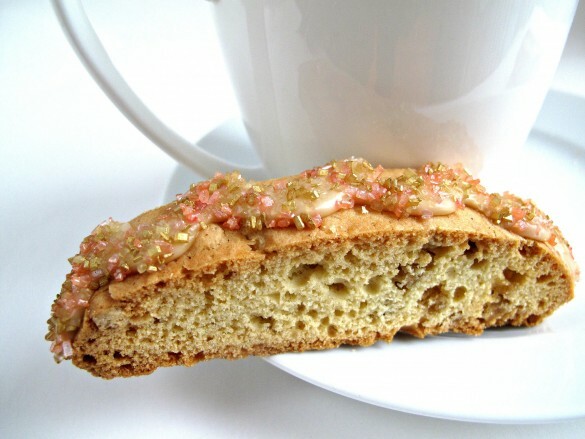 I love biscotti dipped in coffee but I’ve never made it before. Those flav-r-bites are really interesting. Thanks for sharing. 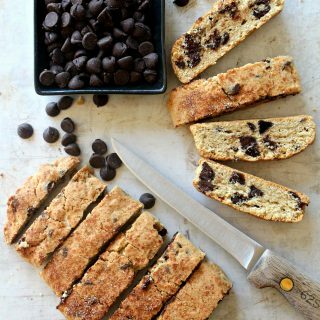 Biscotti are often intimidating but after making them just once, you will be amazed at how easy they are! Make dough-Bake dough in loaf-Slice loaf- Bake again- EAT and enjoy! I think that even with the two bakings, it is easier than scooping/rolling dozens of drop cookies! I was excited that King Arthur sent me the Flav-r-bites to try. They are an interesting baking ingredient. Thank you! These biscotti smell and taste just like maple syrup! I’m in love with this maple biscotti! 😉 So very perfect for this time of the year! Winnie, we need to start an international biscotti lovers club! I was running to the kitchen to bake your pumpkin chocolate chip biscotti this morning! I want to sink one of these into my hot tea right now! 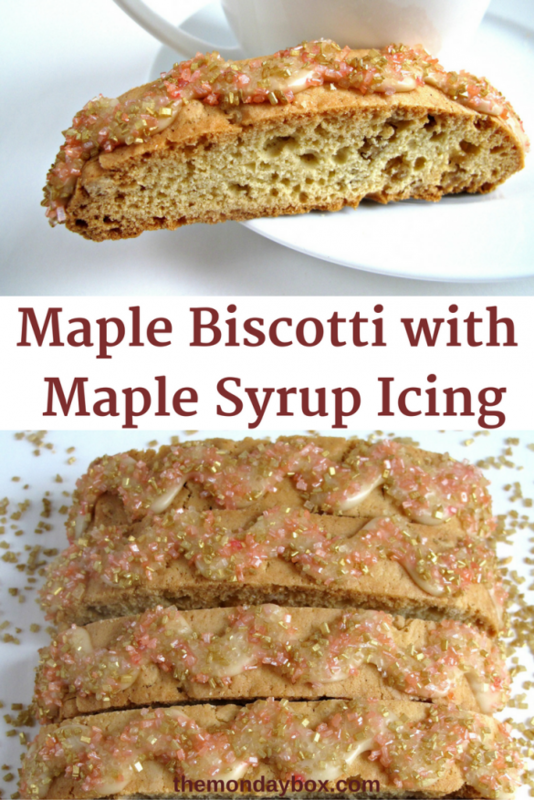 Maple is a lovely flavor for biscotti! Thanks for all your great tips – they’ll come in handy for the holidays! So Maple is one of my favorite flavors too and I had to read this twice because I couldn’t believe that you used the flav-r-bites… I have a bag in my pantry !! I love King Arthur too… I’ve tried so many of their products over the years …baked about a zillion cookies, brownies & cupcakes. I have to say I really like how you explain things, I know it makes it easier for the new or less experienced cooks. I’m very glad I found your site. If you get the chance you should try the little gummy bits (King Arthur ) in your muffins, my g’kids just love them. Now I’m off to make these amazing cookies.